Want an all-in-one recording kit that's tailor-made for capturing great vocals? 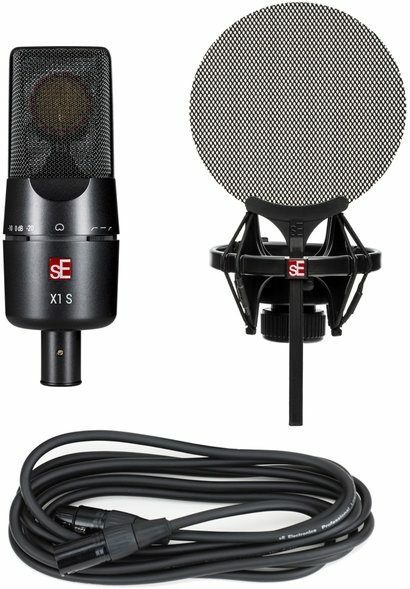 Then check out the SE Electronics X1 S Studio Microphone Bundle. 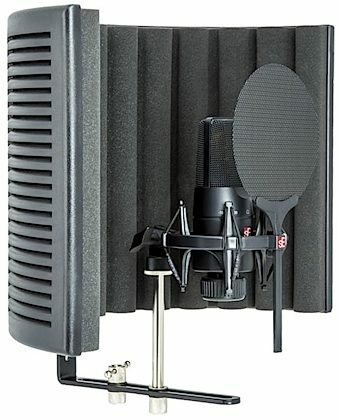 This affordable bundle of recording gear will hit home with home studio artists, as it includes everything you need to get started right out of the box: the X1 S large-diaphragm cardioid condenser microphone, the RF-X reflection filter, a shock mount and pop filter kit, and a microphone cable. The SE Electronics X1 S microphone has a hand-built 1-inch capsule/diaphragm with a -10/-20 dB pad and 2 switchable low-cut filters, outfitted with acoustically damping black paint and black rubber. This versatile microphone's cardioid polar pattern, which rejects sounds from the sides and rear of the mic, makes it especially sweet on vocals, but equally nice on acoustic instruments such as guitar, strings, or percussion. With a frequency response of 20 Hz to 20 kHz, this large-diaphragm condenser helps you capture anything that's spoken, sung, or strummed. SE Electronics' high-performance RF-X Reflexion Filter works hand in hand with the bundle's X1 S condenser mic, providing optimal recording conditions in less-than-ideal recording environments. For quick and easy setup on your microphone stand, the RF-X features a lightweight body and redesigned lightweight clamp assembly. Put the reflection filter behind the X1 S microphone to stop acoustic reflections in their tracks, and gain complete acoustic control over your vocal booth. A pop filter significantly reduces popping sounds caused during regular speech, while also serving as a spit barrier between mouth and mic. Use the included pop filter to prevent clipping as well as prolong the life of the X1 S microphone. The included shock mount cradles the X1 S and further prevents noise and vibrations from affecting the sound of the mic. NOTE: Microphone stand not included. zZounds is an authorized dealer of sE Electronics products. SE Electronics Warranty ﻿SE Electronics offers a 2 year manufacturer's warranty. Customers can extend their warranty to three years by registering their product at the SE Electronics website. If you're recording in a non-acoustically-treated space (bedrooms, closets, etc. ), a Reflexion Filter helps keep your signal clean without the sound of your room around it. The X1 S Studio Bundle has everything from the Vocal Pack, plus SE Electronics' simple and effective RF-X Reflexion Filter so you can record anywhere you want. Made from metal (rather than delicate fabric), the pop filter can be vertically positioned to accommodate any of the above mics, or completely removed from the shock mount if desired. The Isolation Pack comes included with the X1 S Vocal Pack and X1 S Studio Bundle. Also includes a 3 meter microphone cable. Overall: Extremely high quality mic, shield, and accessories. This is the PERFECT bundle for a starting artist. You will not be disappointed.